Club Penguin Cheats by Mimo777 Club Penguin Cheats by Mimo777: Club Penguin New Room? It looks to me like a Town Center with a gazebo and water fountain. There is even a "Notice Board" by the fountain. It would be so sweet if Club Penguin added this new room! And, thanks to tooly228 for an updated image! Do you think this will really be a new room or is it just a drawing in the Club Penguin book? Tell me your theories! Play Diary of a Wimpy Kid - Cheese Touch Chase! It's probably going to be members only. its a conspiracy i tell ya a conspiracy!! Well,Mimo... if that is a new room that would be pretty awesome(probably members only though)! Hopefully we see it around CP soon! Waddle on CP. It's probably looked at in a mirror so the gift shop and coffee shop are switched, and the buildings are backwards! Actually Mimo, If you look closely, the whole picture is flipped (the words, night club sign etc...) So this could quite possibly be a new room! What book is it in? everything looks like its been reflected in a mirror. if u switch everything around it looks like it may be a path to the town from the direction of the igloos. maybe a new way to get to peoples igloos? Wow, I wonder what it's going to be for. Also, is that the Ski Mountain in the background? lol. It could be. If it's a permanent room it might not be. I couldn't imagine a room in the back of the town a members only room really. Me too. It looks intresting. Maybe there will be more shops and stuff to add to the town center. Maybe they're making it a bigger town. Hey i emailed cp bout the ice-cave and they said that maybe a yeti lives there and they said do you think herbert set a camp site up there? and as you know when cp asks questions about stuff its true so this is awesome! It would be good if it's a new room! Hopefully the first ever catalog for non-members! i think it wont be menbers only if its a town centre with a fountaion and gazebo it should be for every one! I hope they add a new room! it looks really interesting. thats probably the docks but they souped(made it better) there may be construction soon for when they edit it! Dude you are off topic anyway i hope the room in the pic should be added for everyone not just for members ! It would be cool if they had a clubpenguin Bank.... like if you wanna become a member you can go to the bank.... or if you want to put all your coins there too. It looks like its close to the dock!! I think they will add the gazebo and the other stuff to the dock. Hopefully it is. Also my friend loves the word, "gezebo". LOL! Maybe a imaginairy room just for the story book? I emailed club penguin yesterday and asked them why we couldn't meet sensei anymore and guess what they said - "well, sensei is very busy training ninjas at the moment but we're expecting card jitsu snow and ice to come out too right? and then when I asked them if it was true and they just said we'll have to wait and see. GRRR!!! I wish people would stop saying that everything is going to be for members only - club penguin are trying their best to make things nice for everyone. Waddle on CP! In the cave mine if you dig with either hard hat or shovel YOU GET COINS!YOU CAN DIG FOR COINS!I hope this gets put on the website! It might not....but for all we know it might not even be a room! hey mimo there is a new thing in the stamp book for the clubpenguin wii game! i hope it is for all players. and the gazebo looks like the one at our camping in france :D. good times, good times. coolio! hope it come soon! ya cp can be cool lik tht! I found a huge glitch! Put on one of the red or orange climbing helmets and wave. Your helmet stays while your head moves. I hope they decide to make it for everyone, not just members.I mean, members get everything! Yay my comments got up there! Well I think your right about the member thing but Cp is right.Sensei is busy.And I hope we get Card Jitsu Snow and Card Jitsu Water! I don't know if it will be, but I really hope so!!! School already started on the 12th for me. Have fun! remember how theres gonna be a mural contest for the school in Haiti?well it might be a playground/park! my uncle works at club penguin - so i shall call him!! I don't think so. Like when the Recycling Plant came out, that wasn't members only. So do I. I want it now! Well,Mimo... if that is a new room that would be awesome(probably members only though)! Hopefully we see it around CP soon! Waddle on CP. It would be totally saweet! But I don't think it will be members only though. Thanks very much for taking the time to let us know about this. That's very interesting that you have found a picture of a place on the island we've never seen before. I wonder what it is! What do you think it is? Do you think penguins will ever go there? You never know what can happen in Club Penguin! Mimo there hasnt been a feild ops for long! It might be a room for the igloos! it looks like it coming from the igloos! Like a little room and then a igloo(or something) when you walk over to it and the igloo list pops up! that would be soo cool! Anyway, I think its just gonna be a little hangout, and maybe you could buy the newspaper every thrusday! Wouldn't that be cool? And there might be a little post office also! If you play animal crossing wild world for wii, there is a notice board and a post office, lol. Maybe its Sensei's place beacause there are a fountain in there right? if it is gonna show up on the map- i wont be members only. Maybe it'll have an opening party and that will be members only, but eventually, it will be open to everyone. i think it might be members only for a short period of time during an opening party, like the cove was when it was first added. ______________________________________Mimo has known this for a long time, but thanks anyway! Well actually, its a photo taken by a camera, therefore it looks like its in a mirror. Wow, that would be sweet. But there really isn't a point. We can store infinite amounts of coins in our inventory. But if we get hacked or something, we could still use the bank money protected by a secret code. Wow really? If you really did you should put like a watermark over it. Its really easy and you can't take it off. Not to sound mean, but you must not play CP much. Its not flipped at all. So this room would be in front of the town, not behind it. ~~~~~~~~~~~~~~~~~~~~~~~~~~~~~~~~~~~it is in the backround let me check! That would be cool if there was a new room! But, I don't think it will be members only. I think they will let everyone enjoy it.Maybe there will be a new place where penguins can hang out. Maybe that new place, will have a new game! That would be sweet! Cool! But it's ovbeise that it's members only. lolz ya pudding whoud be nice, i think your right but lets wait and see. Yes, you did come across some art that we put on hold for the time being. We are always looking at creating new things as well as areas in Club Penguin and I would love to hear your thoughts on the picture. Is there anything that you would change or be excited to find on the island? Know that although I am unable to guarantee any suggestions will be used online, most of the updates made to Club Penguin originate from the creativity of penguins like yourself. Keep up the great work! Mimo this is out of subject but i met billybob! he is tady97! Members only room but, it would be cool if it were for non-members too. Sorry, if the University never comes out!! But my sister and my mom wanted it! Its probably gonna be members only. jewel said...It't probably looked at in a mirror so the gift shop and coffee shop are switched,and the buildings are backwards! I don't think its backwards cause its got a notice board and fountain!Also there is not a fontain at the back of the gift shop,coffee shop or nightclub. But a very good guess! I disagree! If it's in a book it's probably a permament room. If it's a permament room it can't be Member's Only. I have made my point. Awesome, no lie but it was my idea and my mom got free stuff from Disney! It's Tarrog. what book is that picture from?? Anonymous who said "what book is that picture from?" 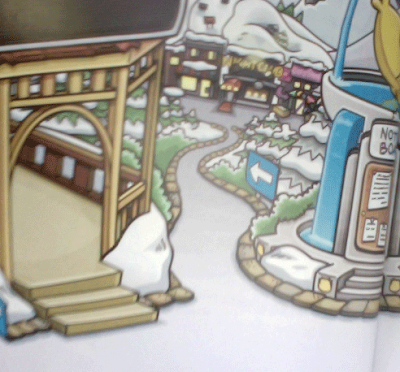 Well, its from the Awesome Official Guide to Club Penguin, an upgrade to the old one which is called "The Ultimate Official Guide To Club Penguin". Hope that helps! I know that it's a new room. I think that its gonna be the new town but if it is members only I dont care cuz im a member!! p.s what book is it from?????? That place might take over from the dock and my penguin is anny2002. I know there is not a new town.Because I emailed them they said no it not a new one it just town. The book he got it from is The Awesome Offical Guide to Club Penguin.